In my childhood my mother taught me how to fold various interesting origami shapes. 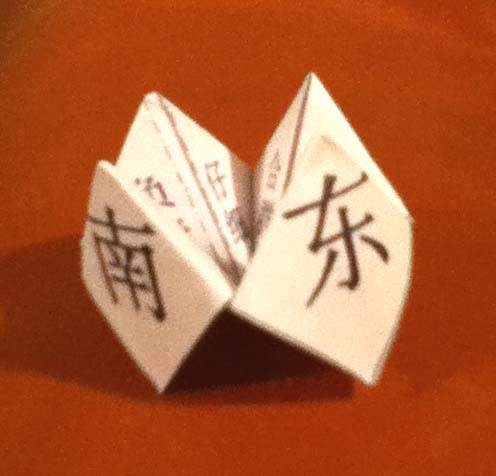 Here is one that could be used as an aid for learning Chinese characters. 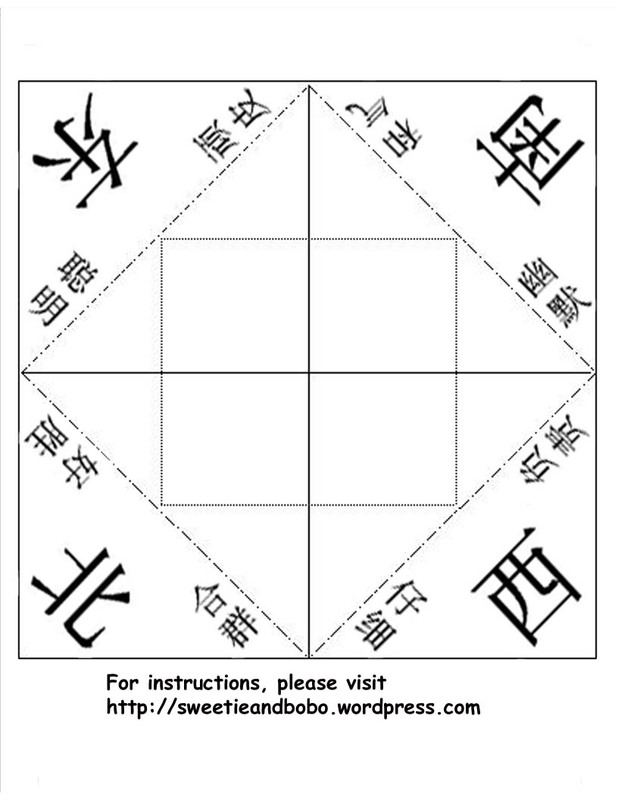 If you use the pattern I’m providing and follow the instructions, you will get on the face of the four-leaf-clover shape the Chinese characters for east, 東 (dōng), south, 南 (nán), west, 西 (xī), and north, 北 (běi). Hidden inside will be a set of adjectives that describe personal qualities. Put your thumbs and index fingers into the four compartments under the face of the four-leaf-clover shape. Keep your thumbs together and your index fingers together and pull your thumbs and index fingers apart to open the clover shape one way. Now pinch your thumb and index finger together on each hand. Pull your hands apart to open the clover the other way. A different set of characters will be revealed each way. You could make your own pattern by writing other terms or phrases in place of the adjectives I’ve chosen. How to play the game: The operator of the shape will ask the player to choose from the characters on the leaves: east, south, west or north. The operator will sing or recite a nursery rhyme at the same time opening the shape to the beat and alternately in one of the two ways. When the song or rhyme stops, the internal characters corresponding to the chosen leaf will be revealed to the player, which may or may not be what he or she was hoping to see. 1. Print the pattern, cut out the main square and hold it facing you. Fold it half both ways (with the characters inside) along the solid dividing lines to form creases. Then open the pattern so it is flat again. 2. Put the pattern on a table with the blank side facing you. Fold in the four corners along the dashed lines. 3. Flit the pattern over to show the side without any characters. Fold in the four corners along the dotted lines. 4. Fold it half both ways along the solid dividing lines to form creases. Then open it to show the printed adjectives. 5. Now, this is a little tricky – Bring the four corners together while pinching the sides to form a pointed well, sort of. 6. Lift up the leaves (with east, south, west and north printed on them) and put one thumb or finger into each pouch thus formed. Practice opening and closing the four-leaf-clover shape both ways. If you would like to make an English or Chinese word card key ring for your children, there are detailed instructions posted at chinesehacks.com.